On Thursday 28th July I will be conducting a workshop to make a bag from this pattern. We will be making either version A or B. Meg at New Threads has recently bought in some lovely heavier weight cotton fabric that is just ideal for, amongst other things, bag making. I decided to use some of the new fabric to make a sample bag and chose the Dark Blue colourway with the charming print of Pink roses. 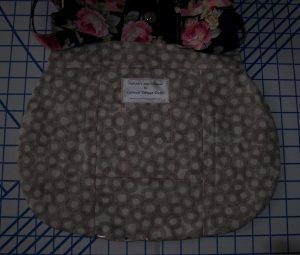 The lining fabric also came from New Threads and is a neutral Beige printed with circles. Simplicity 2396 is quite an easy sew, it seems that the most time-consuming part is cutting out as you have to cut out each pattern piece from the main fabric, wadding or fleece, interfacing and lining. However once that has been done the bag comes together quite quickly and is ideal for a beginner to make. 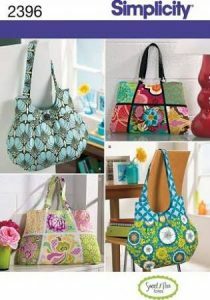 As I had already made the bag once before, this time I decided to add a few extras. 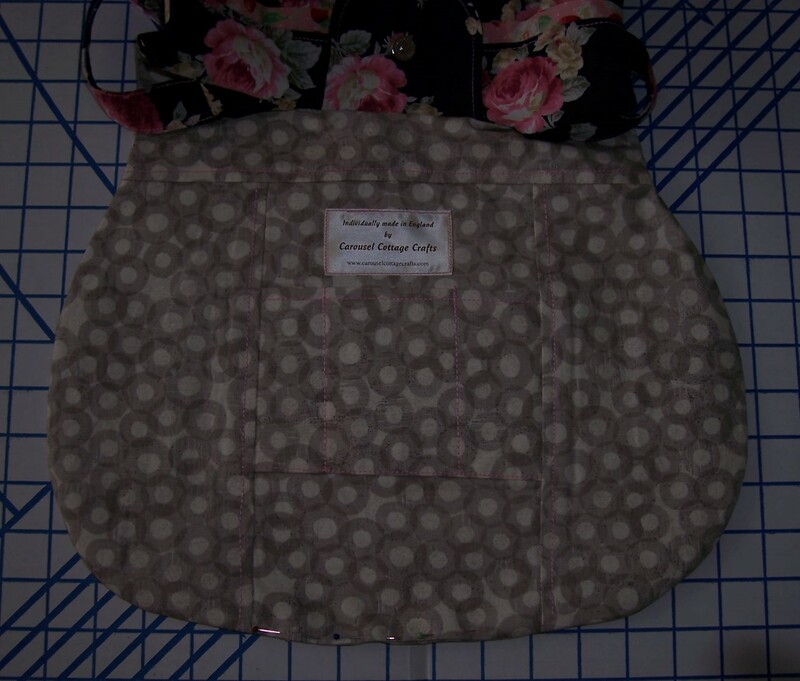 Firstly as I was not adding a contrast band to the top of the bag, I inset a narrow strip of contrast fabric from my stash into the joining seam between the main bag panel and the top band. I included a small “fussy cut” flap with magnetic clasp closure as I feel this is more secure than the loop and button fastening that is shown on the pattern envelope. I also added a small loop with parrot clasp to clip on a purse charm, but most of the changes were made to the inside. 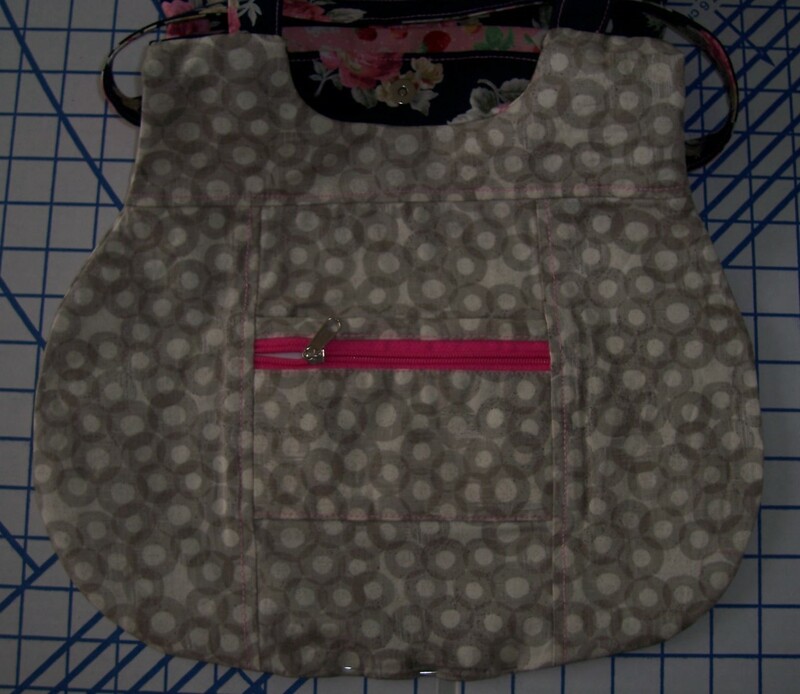 I cut each of the main panels into three sections and set zip and slip pockets (similar to those in the Carousel bag) into the middle sections. 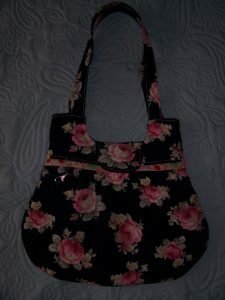 Taking inspiration from Sheila’s bag on Saturday where she had top-stitched her dark-coloured background printed fabric with a contrast Bright Pink thread, I did the same on this bag. In order to get the saturation of colour without resorting to a triple stitch, I simply used two threads in the needle and lengthened the stitch to 3 or 3.5. 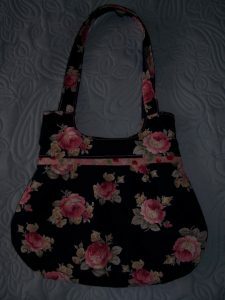 I was very pleased with the finished bag which I passed to Meg to use as a display for both the fabrics and pattern. Hopefully we may get some more sign ups for the workshop as well.